The Eleaf Melo 2 Atomizer is a new member of Eleaf. It is a Sub Ohm Atomizer. It equipped with 4.5ml large e-juice capacity and 22.3mm diameter. It features huge clouds and good flavor. Eleaf Melo 2 Sub Ohm Airflow Adjustable Atomizer - 4.5ml, is remarkably simple and convenient to use. With large liquid capacity of 4.5ml, it featuring the side e-liquid fill hole for ease of refilling. When using EC TC-Ni/EC TC-Ti head, melo 2 atomizer can be compatible with various temperature control devices. 1. Rotate counterclockwise the regulation ring on the top cap to open the e-liquid fill hole. 2. Slowly refill e-liquid into the glass tube. 3. Close the e-liquid fill hole by rotating clockwise the regulation ring. Please make sure the air-inlet holes on the atomizer base are closed before refilling e-juice. Please don't overfill and make sure the liquid level is between 10%-90%. Please first drip a few drops of e-liquid directly into the pure cotton wick in the atomizer head so as to make it fully soaked before vaping. Screw the base off atomizer firstly. Screw off the atomizer head from base and replace a new one. • It comes with 510 thread, fit all 510 thread batteries. • Recommended: MELO 2 atomizer + iStick 60W. • You can buy EC atomizer head here. 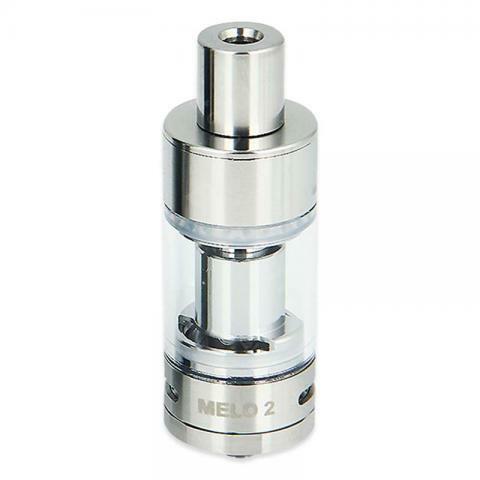 Really super the Eleaf Melo 2 tank and with a capacity of 4.5ml. I always used the 2ml content and was looking for a bigger one because I can use it longer. It is remarkably simple and convenient to use.This Eleaf Melo 2 tank fits perfectly on my mod. I definitely recommend this tank! Eleaf Melo 2 is easy to fill and use with, no leaks, no mess. Nach der ersten Benutzung war ich sehr begeistert hätte mir Eleaf Melo 2 Sub Ohm Atomizer nicht so toll vorgestellt. Very fast delivery! The tank is just gorgeous !!! Excellent taste and pouring steam + Convenient refueling + Easy replacement of the coil + Appearance is quite pleasant. The air flow regulator is well,Very good taste.I advise the goods and the seller!